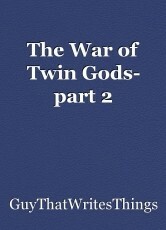 the second part of The War of Twin Gods. If you haven't read The War of Twin Gods- part 1 yet go read it before you read this book or else you'll be really confused (; thanks again! Mavrick and Howard pulled Jarod up the hill, setting him down near a tree stump and the top of the hill, plenty of meters away. Ratoscus held two gleaming, golden knives, each about as long as Jarod's own arm. Tuuxig- the god of darkness, held the fabled phantom bow. It was made of pure darkness and nothing else. It was said that only the most holy blade could break it and that the arrows that it fired could impale anything. It wasn't even pure matter! It could dissapear and reappear in and out of thin air. Ratoscus was the first to move, dashing straight towards Tuuxig dodging an arrow fired by the dark lord. Darkness and Light jumped into the air. A dagger deflected an arrow on the jump up and the other dagger slammed into the bow, making a small dent in it. Tuuxig hissed and retaliated. He fired another volley of arrows and charged forward, his bow shifting into a blade. The two blades met and there was a bright light, which was consumed by darkness. Ratoscus flew out of the fight, through two trees, and well into the mountain. The dark blade turned back into a bow and fired three shots into the mountainside, turning up earth, and creating a cloud of dust, with the Lord of Light trapped within. The twin light blades occasionaly shimmered dimmly in the smoke. Jarod heard a grunt of pain, at sparks. More sparks. When the smoke cleared, Ratoscus was a bloody mess. There were cuts all up his right arm and left leg, as well as his back. Tuuxing hung over Ratoscus, dark blade pointed down at Ratoscus's chest. Ratoscus started to stir. The blade came down as Ratoscus's right arm went up. The blade had gone into the arm, fully disabling it. Tuuxing tried to yank it out but it wouldn't budge. "Heh. So... this is how it ends, brother." whispered Ratoscus. Tuuxing was acting mad but his eyes were full of fear. He kept tugging on the blade, but it wouldn't budge. "It's a binding spell I learned from father. This is your fate. YOU WILL DIE!" Those were the last words that Tuuxing heard, and Jarod watched as his soul floated down, through the earth, to hell. Jarod looked back to see if his comrades were still there, which they were. When he looked back, Ratoscus was gone, the leafes still flying from his hasty retreat. Jarod walked up the hill to his comrades, patted them on the back, forcing them forward, and said, "Let's go home." Thanks for reading my short story series, "The War of Twin Gods,". For people that are religious, these "gods" are not real. I do not believe in them and they were soley for the purposes of these stories. Again, thanks for reading. Feedback is welcome along with book requests! Happy Reading!